Which toxins are the worst? What does our body do with the toxins exactly? What symptoms should we expect to see as our toxicity levels rise? How do we, uh, get them out? Many of us want details before we take action because, let’s face it, detox isn’t fun. I have one word for you. 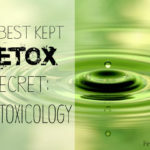 It’s the best kept detox secret: Homotoxicology. It was founded by a German orthodox physician named Hans-Heinrich Reckeweg who studied medicine in Berlin, came into contact with homeopathy, and began integrating his ideas into a framework that’s part of what’s known as German Biological Medicine. We should normally be excreting toxins through our primary pathways via feces, urine, breath, and sweat. Go ahead and look askance at someone who “sweats like a pig” but let’s be very clear: excretion is life saving. If you have regular bowel movements and you’re drenched after a workout, then consider yourself among the fortunate. Many of us, however, are just plain backed up. Much as we give our HVAC systems seasonal attention and empty our dryer’s lint trap, the same is true for our bodies. We need to open our channels of elimination. When the primary excretion pathways are blocked, we lean on the secondary pathways, which include kidney, liver, and lymph. This is where we find a bunch of trouble. You see, these systems are challenged. They’re beseiged by toxins in the air and water, toxins in our food and personal care products, toxins in drugs and vaccines. Once I started thinking in this way, I looked at my body and my children’s bodies differently. A little constipation took on a whole new meaning. I’m actually grateful when my son has a skin rash; it’s uncomfortable but I much prefer it to the alternative. I want to do whatever I can to support the body’s ability to eliminate toxins. Basically, the body tries to get toxins out in the most direct and efficient manner. We have an expansive toolkit. When Pee, Poop, Breath, and Sweat aren’t enough, there are other, exigent and efficient ways that we expel the bad guys. These include the Four Messengers of Health — namely Vomit, Diarrhea, Fever, and Mucus. Now, I’m not saying they’re fun. But more often than not, I believe we must resist the reflexive urge to proclaim ourselves “sick,” and lunge for the Pepto Bismol, Nyquil, Tylenol, or Robitussin. I lay out the welcome mat, whisper a silent prayer of gratitude that my child’s body is working, and ride it out. Read this guide on Fever & Non-Intervention for a bit of support. I believe that what we call sick is actually the road to wellness. And what we call medicine — the varied Rx pills and OTC sticky, sickly sweet, fluorescent goop — is an expressway to pathology. If the excretion pathways are blocked or suppressed, the body loses that battle. As toxins settle into the body, Reckeweg’s theory actually predicts the symptoms and disease states we can expect to see. He links such seemingly unrelated ailments as eczema and asthma, which many parents and practitioners suspect are related but are hard pressed to explain why. When lots of energy in the form of inflammation fails to oust the toxin over a period of time, the body loses steam. There are many different ways that we manifest this kind of depletion. Neoplasm is the ultimate expression of toxicity. The human body is insistent and will always try to get our attention early on, often with gentle nudges. We are annoyed by these nudges and try to make them go away with painkillers, antibiotics, or anti-inflammatories. If the source of the problem is not addressed, however, the symptoms will merely increase in severity. Symptoms of disease are the result of appropriate biological resistance to toxic substances. In other words, conditions such fevers or skin rashes are predictable and salutary ways that we respond to toxicity in order to cope and survive. If we attempt to suppress the symptoms at an earlier phase, for example, through the use of chemical antipyretics, steroids, or other medications, we drive the toxins deeper into our cells. We may think we’re “all better” when the fever or itching disappears but over time, we pay a high price for immediate relief. Reliance upon allopathic drugs short-circuit the innate intelligence of our bodies and promotes advancement of serious illness and disease. Homotoxicology can be thought of as a “bridge” between allopathic and homeopathic medicine. Its main focus is to rid the body of toxic substances and restore the body to optimal health. Homeopathy addresses the source of disease symptoms and supports wellness through the use of heavily diluted natural substances. Organ and material specific drainage and other remedies can deliver some gentle homeopathic “Drano” to our “emunctories” (I love that word… it’s just a fancy way to describe our excretion pathways). Some homeopathics contain the energetic blueprint of healthy tissue; others contain the frequency of substances that cause disease. The body responds to subtle signaling from homeopathic remedies that tell it how to prioritize scarce resources to heal. Think it sounds far-fetched? Consider that our bodies are regulated with exquisite precision via secretion of the minutest quantities of hormones and other regulatory compounds. The efficacy and safety of homotoxicology and homeopathy are supported by over 100 clinical trials. Anti-homotoxic remedies stimulate the body’s own healing process to cure illness. Homeopathic remedies provide a blueprint of healthy tissue which “reminds” the body how to prioritize and redirect its resources to return to health. When we get toxins out of our way, the body strives to return to homeostasis. Homeopathic detox is often more gentle because it works with the body and allows the body to self-regulate. As I mentioned above, there is a hierarchy involved in detoxification. The body will self-regulate, typically discharging the more mild toxins first. Practitioners will sometimes use serially agitated homeopathic dilutions, and homeopathic, nutritional, and botanical remedies to support the body through the inevitable side effects and “aggravations” as toxins mobilize within the body and ready themselves for excretion. HOW DOES IT DIFFER FROM CLASSICAL HOMEOPATHY? Many homotoxicology practitioners use homeopathic remedies in combination. The environment has become so toxic that our genetic blueprint has become more damaged. In response to more serious chronic illness and even neurological damage, some practitioners are finding that the classical “one remedy at a time” approach may no longer be sufficient. ARE THERE ANY SCIENTIFIC STUDIES I CAN READ? Wayne B. Jonas, MD, former Director of the Office of Alternative Medicine at the National Institutes of Health, recognized successful trials of homeopathic immunotherapy (serially agitated dilutions) to treat chronic illness in Annals of Internal Medicine. Since environmental toxins have transgenerational effects, we’re also addressing the sins and exposures of our forefathers. Here’s an interesting study on transgenerational inheritance of an epigenetic state in Endocrinology. I don’t want to detox! Most of us don’t want to detox. At best, it’s a hassle. At worst, it’s painful and can be sort of… gross. CAN’T I GET WHAT I NEED FROM FOOD? If food is our first and best medicine, and our bodies know what to do to return to health, why can’t we just eat right? Nice try. It’s true that some people change their lives by changing their food. But others need more help. First, food is simply less nutritionally dense today, thanks to modern food production techniques, including extensive use of pesticides, GMOs, inadequate crop rotation, and severe pollution from many sources, including animal waste pools. So it’s tough to get all we need from three squares and a couple of snacks. In just 50 years, a mere blip on the evolutionary calendar, we have made dramatic changes in how we live and what we eat. Man has been unable to evolve quickly enough to adapt to our new environment. We, and our children, are living proof of the consequences. This is where a deeper conversation about homeopathy and other alternative modalities comes in. Homotoxicology can operate independently or synergistically with other treatment plans. Homeopathy isn’t just for detox. Many families use also use it as a safe and realiable form of first (and second!) line defense to support symptoms of imbalance, illness, and trauma. I know you want more specifics on who might benefit from homotoxicology and how to implement such a program. We have the first of several radio shows coming very soon (check back here and I’ll link the radio blog as soon as it’s published) and we’re inviting experts to write about it for us, too. The allopathic system of medicine prevails today. Allopathy uses pharmaceuticals to suppress disease symptoms but fails to address root causes. Drugs add layers of chemical toxicity, which often end up causing bigger problems over time. Despite vehement and angry resistance from mainstream medicine, homeopathy prevails because it works. If you’re interested in the history behind this, I recommend that you listen to this radio show “Surprising Lessons from Medical History” with historian Erika Janik, author of Marketplace of the Marvelous: The Strange Origins of Modern Medicine — A History of Botanical Remedies, Hypnotic Suggestion, Water Cures, and Other Alternative Medicine in Nineteenth Century America. Her book is a fantastic and astonishing read. It is also instructive and affirming to many of us who are pursuing integrative, functional, and alternative solutions for our families’ health needs. Louise Kuo Habakus is the founding director of Fearless Parent™ and lead host and producer of Fearless Parent Radio™. She is a bestselling author; runs two non-profits, Center for Personal Rights and Health Freedom Action; lectures widely; and has appeared in numerous media outlets, including ABC World News Tonight, Fox & Friends, and The New York Times. Louise was a Bain consultant and a C-level executive in the financial services industry. She holds two degrees from Stanford University. Louise is on the board of Focus for Health Foundation, and the advisory boards of GreenMedInfo, The Documenting Hope Project, and SHE Living TV. She is a certified KRI Kundalini Yoga teacher and the mother of two. She loves to trade detox stories. She studied homotoxicology with one of her mentors, Mary Coyle, DIHom, who is a co-host of Fearless Parent Radio and runs the Real Child Center in NYC. Read her full bio here.